High-Density Broadband 5-12 MHz Linear Probe in Standard Config. Call us now at 800-839-0722. We can answer all of your questions about adding ultrasound to your practice and help you make the best choice of a new ultrasound. An improved operating system with greater stability (so your system won't crash). A 160-gig hard drive (so you never run out of space for your images). The latest SRT "Speckle-Reduction" technology (so your images are sharper). A much more extensive zoom (so you can zoom in twice as much as before). Picture-in-Picture zooming (so you can retain visual anatomical clarity of position). An expanded focal range (giving you 32 focus zones, for greater clarity). Improved transducers (for increased resolution ... and even an available 4D probe). 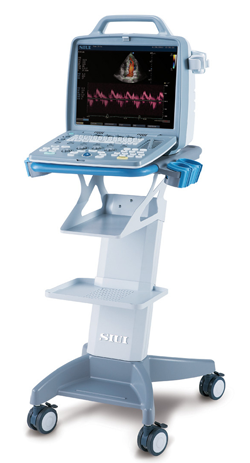 Ultimately, for the very best imaging, and the latest in affordable 4D imaging for Rheumatology, Musculoskeletal, and OBGYN applications, the new SIUI CTS-8800+ is going to provide you with that next level of ultrasound imaging — without breaking the bank. What contributes most to the image quality on the CTS-8800+? Custom Probe Stand-Off for enhanced superficial imaging. 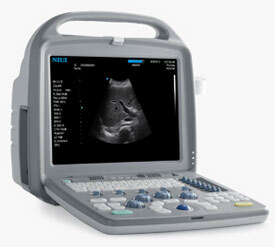 Are you using ultrasound already? Is the 4D probe of interest to you?